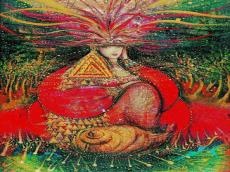 Azerbaijan’s popular surrealist, Mehriban Efendi has presented her work at Visionary Art exhibition, which takes place in the Moscow House of Artists from March 27 to April 1. Artist’s colorful painting "Mystic of the Night" is put on display, Trend Life reported. Paintings are some kind of portals that will open up endless possibilities of existence and self-expression, it is a path of feelings. The development of this style goes in parallel with the spread of eastern spiritual practices (for example, yoga), a technique of penetrating into the depths of the subconscious, an interest in the pagan and pre-literate past of peoples. Efendi's works are exhibited in Portugal, USA, Holland, Bulgaria, France and other countries. Mehiban Efendi awarded a number of international prizes in Germany, France, Macedonia, Bulgary, etc. The outstanding artist also worked as a costume designer with the German filmmaker Veit Helmer in his comedy “Absurdistan,” shot in Azerbaijan in 2008.